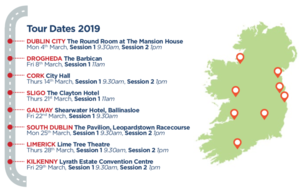 At the Mansion House in Dublin. 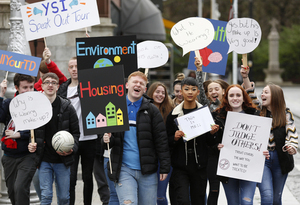 The Young Social Innovators’ national Speak Out Tour (top), which will see some 6,000 second-level students take part in events across Ireland this month, was launched. 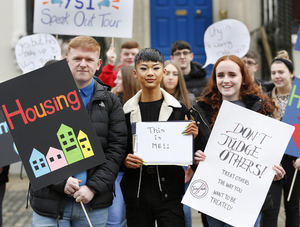 Pictured at the launch above are fourth-year students from the Donahies Community College, Dublin 13, (in top pic) Lee Forrester, 16; Tony Lien, 16; and Aoife McDonald, also 16; with Lord Mayor of Dublin (above) Councillor Nial Ring. 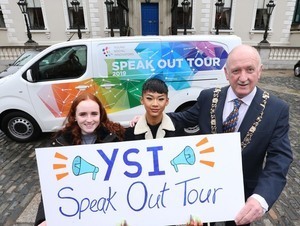 Posted in Misc and tagged Speak Out Tour, Young Social Innovators at 2:27 pm on March 4, 2019 by Bodger.